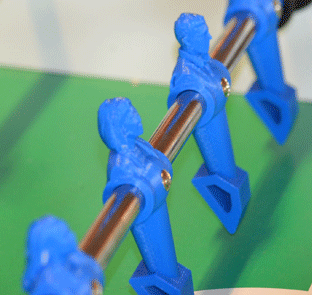 Geomagic's 3D Printed Custom Foosball Table is a Score! Watching the recent London Olympics, you see some pretty bizarre sports rhythmic gymnastics, BMX, handball and of course, my favorite, trampoline (one of the criteria used for judging is flight time seriously?!). But should the IOC decide to up the nuttiness factor another notch and add one more, Geomagic will be ready. The sport to add? Foosball! Okay, so not a sport. Really more of a parlor game that is very conducive to resting a beverage on. 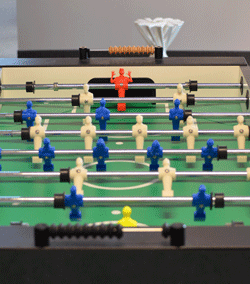 But here at Geomagic's headquarters in North Carolina, we have our very own customized foosball table a full 11-on-11 table populated with Geomagicians as foosballers! 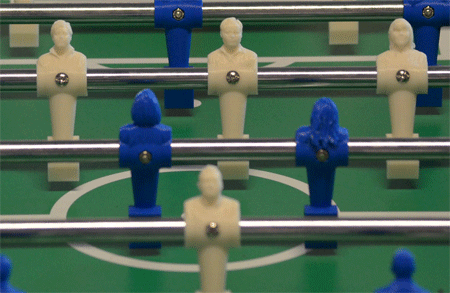 (Image right: The completed table with Geomagic employees as foosball players). This idea came about one day as I was walking around our new offices late last year. In our game room, we have a foosball table, alongside an arcade game machine, yoga mats, bean bags, a big TV and of course, the infamous ping pong table (sidebar: if Geomagic were a country, I am pretty sure we would have won at least one medal in table tennis at the Olympics, putting us into a tie with Botswana and Cyprus in the medal count). As I played some foosball, and looked at the goofy dude whose mug adorns all the players like some sort of"Clones vs Clones" matchup, I thought,"how cool would it be to scan ourselves and make custom players?". And then I did nothing with that idea for 6 months. Fast forward to April of this year. I happened to walk by our Tech Lab one day and saw a colleague scanning another colleague, a sight which is not altogether uncommon around Geomagic. But what caught my eye was who was being scanned our IT guru, Duncan Bell, he of the shaved head, long goatee and menacing physique. The perfect candidate for an imposing foosball goalie! Armed with a polygon mesh of Duncan's dome, I then set about creating a digital version of the working end of the foosball player the part that attaches to the rod and actually kicks the ball. I took off one of the"men" and brought it into the Tech Lab, clamped it to the work table and scanned it using a laser scanner mounted to an articulating arm. 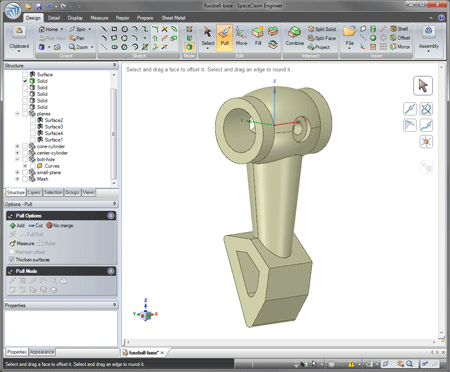 It took only a few minutes to collect more than enough data to create a CAD model. I also used the probe that attaches to the end of the arm to collect more accurate information on the mounting hole, to ensure that when I was done it would, you know, actually fit on the rod! Back to my desk, I merged all the scan data and probe data into single mesh with associated features. I then used our Geomagic Studio software to extract some of the basic shapes of the model, like the barrel-shaped portion that fits over the rod, the cone that extends down from that, and the most important part, the uni-foot (technical term for the thingy that actually kicks the ball). Then, wanting to experiment with one of the cooler CAD packages out there, SpaceClaim, I sent the data over via our direct exchange button and started putting the pieces together. Pretty soon, I had a CAD model of the base. Now all that remains was to put the head on it. At the time, back in April, we did not yet have a 3D printer in house, so I used a 3D printing service called Shapeways to print two prototypes. Ordering was easy, reasonably priced and the models showed up about a week later. A quick fit check and, yes, they fit on the table! 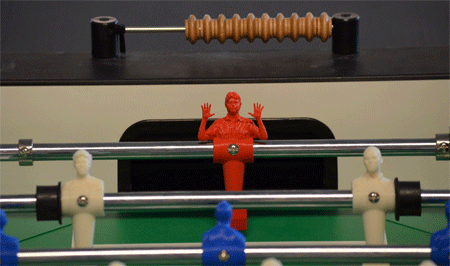 As we passed the two little prototypes around over the next few weeks, we decided it would be cool to go ahead and make a foosball player for everyone in the office. Which required a lot of scanning! Thankfully, we had volunteers to lead the effort, and over the course of a few days, scanned most everyone. Soon we had a library of scans that we began to call the Geomagic"Facebook" (cool name wonder if that is used anywhere?). 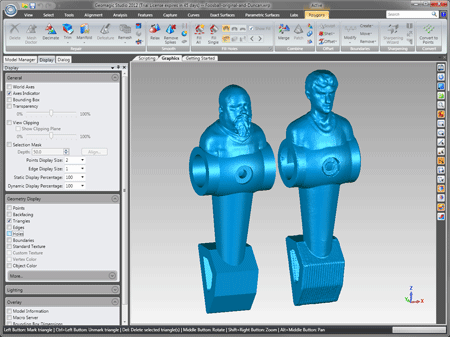 Next came the task of merging each scan with the base model to make complete, ready-to-print STL's. All of this work was done in Geomagic Studio by some of our talented engineers, and the results were terrific. Some models were then imported into our Sensable products, where the mesh is converted into"digital clay" so that the operator can use a haptic device to"sculpt" new details like hair or facial features onto the players. This is a fun tool as the force feedback really gives you the tactile sense of molding a shape with your hands. Each model was ready to be made. Luckily, it was about that time that we took delivery of our new Stratasys UPrint 3D printer. After a couple of quick test parts, we began firing off batches of players, about 8 at a time. A few days later, we mounted the players onto the rods and had what we believe is the world's first completely customized foosball table! At center striker, of course, is Geomagic founder and CEO Ping Fu (Image: left). Appropriately enough, immediately to her right is exec assistant Cecilia Gonzalez. In goal you will find Trey Wilson and Szmore Kovacs, the guys who play goalie for the real life Geomagician indoor soccer team. Arun Kunjur, (Image below) QA Manager, faces off against Ping, while developer Dmitry Nekhayev takes up a defensive position near to Szmore. Granted, the technologies used to produce these custom players is still a little pricey for the home enthusiast, but this little experiment shows the kinds of applications that could be done once the hardware and software come down in price, which they will. Already we are seeing usable scan data from a $250 Kinect sensor, and rapid prototype machines can be found for only a few thousand dollars. Click on the window below to see and view Duncan's 3D model data in real time.